The idea of authentic leadership has been around for a long time, even if it was known by different names until the term ‘Authentic Leadership’ popularised in 2003. Since then, the term has become business jargon, often overused and not well enough understood to be meaningful. But there is something behind the jargon – ideas and concepts that have been around for centuries that can help leaders lead people by having a sense of self-awareness, identity, honesty and passion. 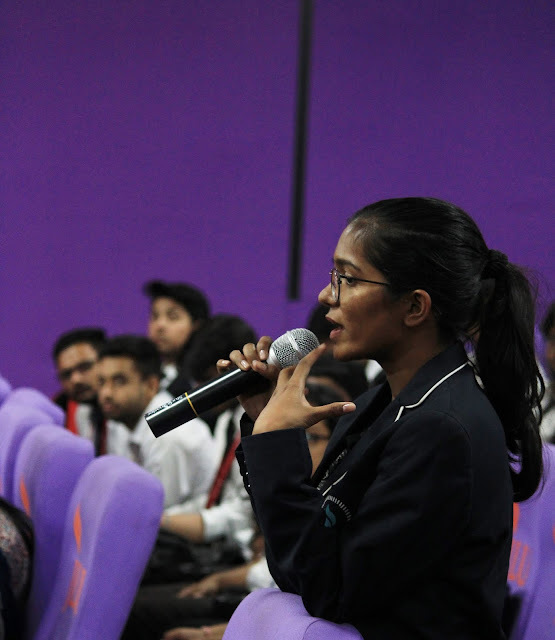 Jagran School of Journalism and Communication organized an Igniting Minds Lecture on #Authenticity delivered by Ms. Sangeeta Chacko on 5th April 2019 at Jagran Lakecity University. With over 26 years of proficient experience in the marketing and communications arena, Ms. Sangeeta Chacko, Head – Corporate Communications, Percept Ltd, has handled a diverse range of portfolios with leading global organizations including O&M Advertising, The Walt Disney Group, TCI, Abacus and Kuoni. An international & national award winner, she is a recipient of 2017 Albert Nelson Marquis Lifetime Achievement Award and has been featured in the ‘Marquis Who’s Who In The World®’ 2014, 2015 & 2016 Directories featuring global achievers. She has also been conferred with the ‘World Women Super Achiever Leadership Award’ in 2017, the ‘Bharat Excellence Award’ and ‘Rashtriya Mahila Gold Award’ in 2014, the ‘Outstanding International Business Communicator Award’ and the ‘Rashtriya Nirman Ratna Award’ in 2013 in recognition of her outstanding contribution to the communications, academics and the CSR domains. Ms. Chacko spoke on Authentic Leadership and its importance in the New Business Era even as old corporate models collapse due to misguided norms, expectations and practices. Stressing upon #authenticity she bestowed words of wisdom to align with inner awareness & act from a space of calm, honesty & equanimity. She stressed on the perceived level of expectation around what a great leader should do and how she/he should behave. These expected norms can create myths about leadership being inspirational, exhibiting unrelenting confidence, having unwavering decision making, showing unshakeable self-belief and revealing no signs of personal weakness. In authentic leadership, whilst some of these may well help in the execution of the role, the real test is somewhat more grounded. When a leader is authentic, honest and strongly aligned with their inner values, they are able to modify how they communicate to suit the sensibilities of those around them. Nothing is lost in their honest communication; they know how to moderate it so that it resonates with whoever they are dealing with. They have a deeper understanding of not only their own emotions but also the emotions of others. Concluding the session it was revealed that when you are comfortable in your own skin it becomes easier to treat others in an open honest way. Your inner values are reflected in your behaviour; you are not so susceptible to outside influences. Integrity becomes natural to you, and you don’t feel the need to compromise your values even when under pressure.